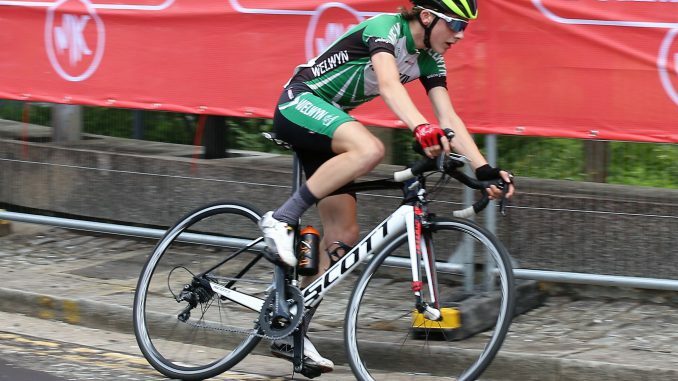 Fantastic win for Joe Kiely – the new BC Circuit race under 14 National Champion. The Championships were held in Milton Keynes Town Centre on Sunday with large fields on a great course. There were 70 riders in the under 14 event and Joe Kiely was clearly in an attacking mode right from the start – an early breakaway group was reeled then Joe went again and was joined by Fin Pickering and Josh Charlton ‘making a magic medal winning trio’. They worked together and soon built and held a lead of 20 seconds. The bunch did not react to chase them down and the gap opened up slowly to build up a winning lead. As they approached the long uphill finish one of the trio attacked and Joe was straight onto his wheel. As they neared the line Joe attacked and crossed the line in first place by one second to win the National Championship. A magnificent result for Joe, who has been on sparkling form this year in road, MTB and cyclo-crosss events. A well deserved victory for a tough hard working committed Welwyn Wheelers rider. Tom Sharples was in the main field mid way through the race but lost contact when he hit the kerb on a bend. Euan Woodliffe had a mechanical in lap one and retired The under 16 race had almost 100 riders and was run at a frantic pace shedding riders every lap. Oli Stockwell finished in the main bunch in around 25th place. Josie Griffin and Lauren Higham finished in the bunch in the under 16 girls race. Also on Sunday a number of Wheelers riders were at Redbourn Common for the Fete du Velo races run by Verulam CC from St Albans. Xavier Knott won the opening Under 8 category race by a good margin with Harry Hayter 6th. In the Under 10 race Rupert Cavill wa second followed in by Dillon Knott and Jeremy Landon in third and fourth places. Beth Bennett and Henry Landon were third girl and boy in the under 12 event. Joe Bennett attacked with two laps to go in the under 16 race and won by 10 seconds with Archie Peet taking second place in the sprint finish. After a short break Joe Bennett and Nathan Blackmore lined up for the Senior 2/3/4 category 45 minute race – Joe rode well to finish in the main bunch in an extremely fast race. In the Womens race Leslie Courtney finished in 5th place and Rachel Dunne 7th. Steve Dunn was 8th in the Masters category.